Most makeup enthusiasts are aware of the fact that there are multiple online communities dedicated to the swaping and selling of "gently" used cosmetics. The products exchanged tend to be on the expensive side, such as MAC, Bobby Brown or even Urban Decay. I know I will probably get a lot of hate mail and spamming for what I am about to say, but oh well. The buying of used cosmetics is justified as providing an inexpensive outlet for gals low on cash to indulge in the finer cosmetics. The sellers may think they are innocently earning a few extra dollars, when in fact they are helping the spread of disease and germs. For those contemplating taking part in online makeup swaps stop and think. 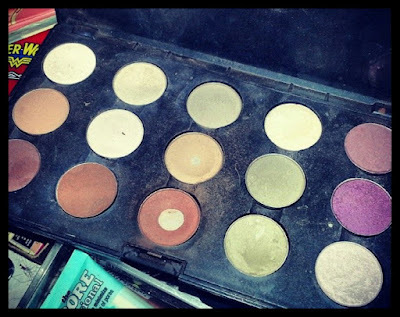 It is one thing to borrow a best gal's eyeshadow, but it is a completely different ball game when swapping or purchasing makeup from a faceless person online. You may think you are saving a few bucks by going this route, when in fact you are actually going to lose out when the doctor bill arrives for that nasty eye infection you inherit. Still not convinced? Applying used makeup can even lead to the Herpes virus, according to Discover Fit & Health. That's the kind of gift that doesn't go away. Buyers also risk the chance of being stuck with counterfeit items passed off as the real deal (comon among highend brands like Mac Cosmetics, NARS & Urban Decay) which often circulate online auction sites.